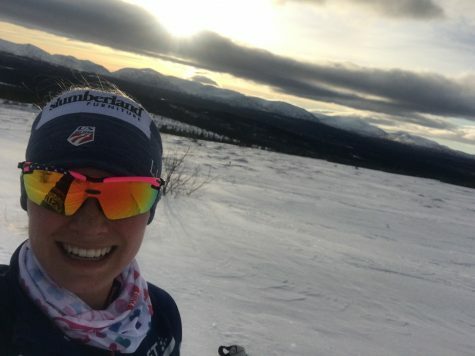 It’s always tricky to know EXACTLY how to best prepare for the upcoming World Championships, but all you can do is make your very best plan and then run with it! And that’s what we did. 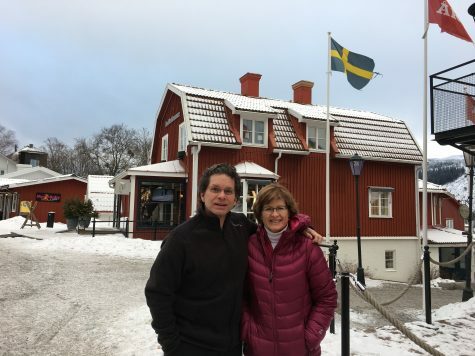 To me, spending 2.5 weeks in a cozy little town in Sweden accompanied by my boyfriend and my parents was my ticket to finding my happy place and also absorbing as much quality training as I needed. 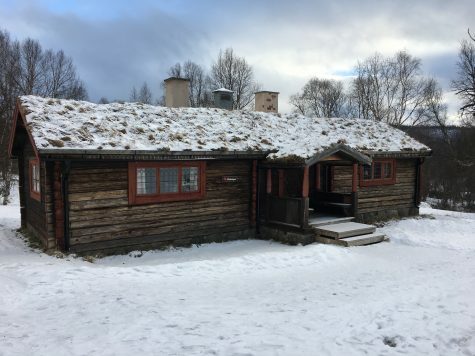 Which means that I’m writing this from an adorable log cabin in the mountains in Sweden, in a town called Vålådalen! First and foremost, a big, huge, whopping thank you goes out to the staff here for hosting many of us ski team athletes and giving us the best possible grooming and trails! The camp has been awesome and I’m really grateful to be here. With 30km of trails, it’s easy to find the training I need whether it’s a gentler rolling trail or some hard climbing! Can we all take a moment and admire how stinking cute this is? 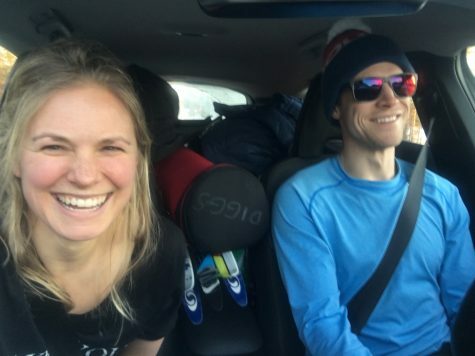 Wade arrived in Falun to see me race in the 15km mass start, and the next morning we packed up and road tripped it over to Vålådalen! I’m not one for long car rides, but it was pretty cool to drive across Sweden and see a lot of the little towns and all the lakes. Reminded me quite a lot of Minnesota, actually. Me and my chauffeur on our way to Valadalen! 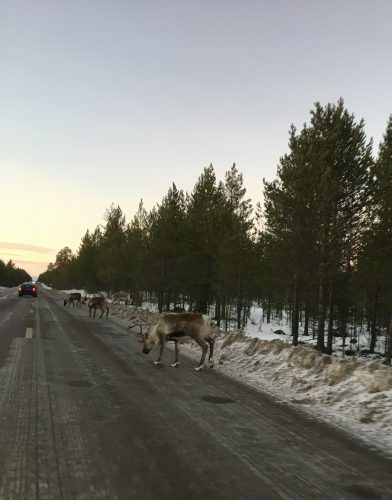 That is, it reminded me of Minnesota except for the reindeer on the road part. That was different. I got to show Wade how to scrape and wax skis (imagine! Me, as a waxing coach! Hah!) and I don’t think I did too bad a job with it either. Then, I got to teach him how to ski! He was an incredibly fast learner. 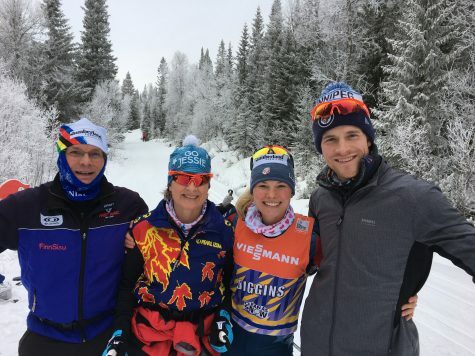 When my parents arrived they overlapped with Wade by a day and we all got to go on a group ski together while I warmed up for intervals! 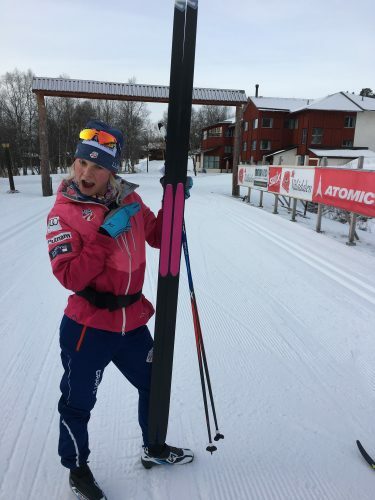 It was by far my happiest ski of the year. 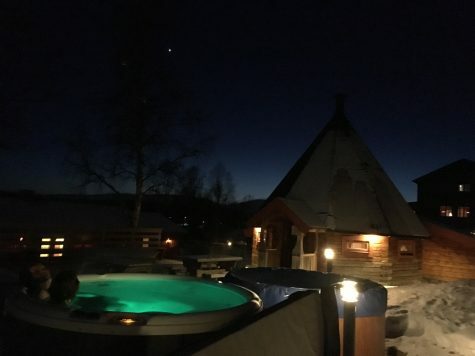 Nighttime hot tubs to relax after a big day of skiing! 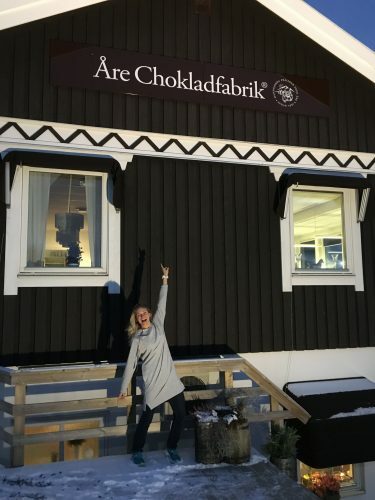 Day trip to Åre with Mom and Dad! Isn’t this town cute? 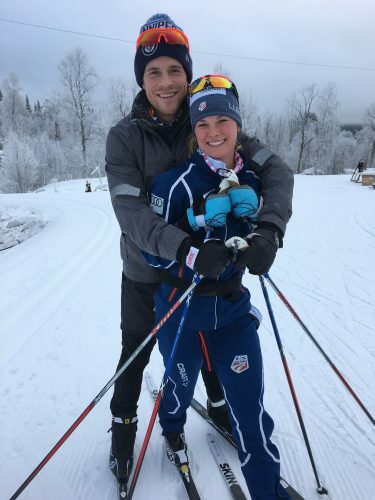 I have been so, so lucky to have my boyfriend and parents make the trip all the way over to Sweden so they could come ski with me and hang out! My “happiness meter” is topped out and that’s really saying a lot, since I’m a pretty happy person to begin with. Everything great about skiing I learned from Mom and Dad, starting with me getting a ride around the local trails in their backpack. Yes, now that I think about it, that was probably the height of my career – getting a free ride while looking stylish! But in all honesty, I have my Mom’s ability to appreciate every beautiful thing on the trail and I inherited my Dad’s race style and (I kid you not) his exact same “race face” expression. I know this because I used to stand on the trails banging a cowbell around cheering for him, and now when I see photos of myself racing I recognize the face I’m making. 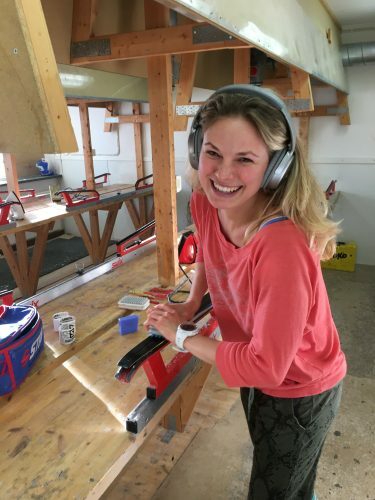 And from both of them I inherited the love of skiing and boundless enthusiasm for working hard! I am fortunate to have many heroes and mentors in my life that I look up to, but Mom and Dad will always be number one in that department. Oh, how times have changed. 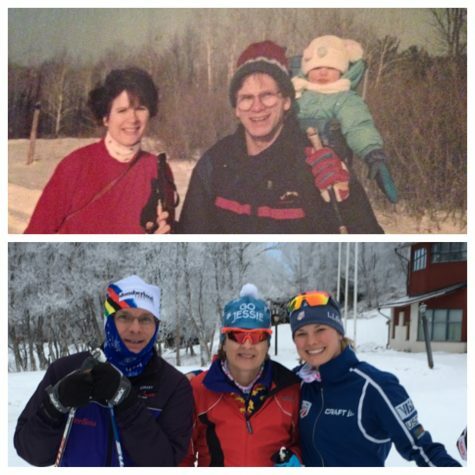 Mom, Dad and me 23 years ago, and now. With all the hard work done, now it’s time to taper off and just enjoy! 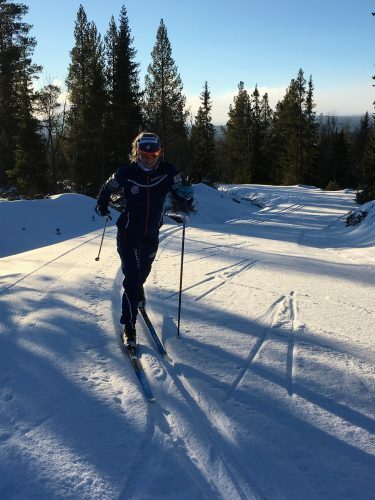 We head to Otepaa, Estonia on wednesday for one last World Cup weekend before the Lahti World Championships start on February 21st. Wish us luck!